The leading independent specialist for windscreen replacement and windscreen repair based in Aberdeen and serving all of the Aberdeen area. National Windscreens Aberdeen fitting centre provides windscreen replacement and windscreen repair services to businesses and individuals throughout Aberdeen and the Aberdeen area. The A90 is the main arterial route into Aberdeen running north to south and linking the city to Edinburgh, Dundee, Brechin, Perth Ellon, Peterhead and Fraserburgh. Aberdeen also sits on the A96, A93, A944 and A92 and A947 providing easy access throughout Aberdeenshire. 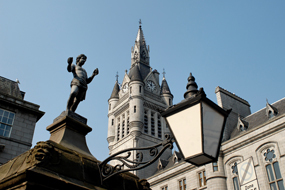 The shire is home to the country's largest National Park and a stunning coastline, whilst the city of Aberdeen is renowned for its granite architecture, history and arts scene. The Aberdeen windscreen fitting centre and its mobile vehicle glass technicians service the needs of Aberdeen and the surrounding area including Fraserburgh, Peterhead, Ellon and Stonehaven. With 108 fitting centres and over 800 mobile technicians, National Windscreens operates the UK's largest windscreen repair and windscreen replacement network. The company provides low cost, high quality windscreen replacement and windscreen repair from its Aberdeen fitting centre 24 hours a day, 7 days a week, 365 days a year. Repair and replacement of all types of vehicle glass including windscreens, rear windows and side windows is undertaken throughout Aberdeen and all of the Aberdeen area.